For Janet MacPhail, photographing retrievers in training is the perfect way to spend an evening. 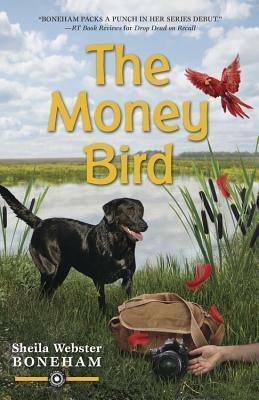 But a photo session at Twisted Lake takes a peculiar turn as Drake, her friend Tom's Labrador, fetches a blood-soaked bag holding an exotic feather and a torn one-hundred-dollar bill. When one of her photography students turns up dead at the lake, Janet investigates a secretive retreat center with help from Australian Shepherd Jay and her quirky neighbor Goldie. Between dog-training classes, photo assignments, and romantic interludes with Tom, Janet is determined to get to the bottom of things before another victim's wings are clipped for good. Sheila Webster Boneham is the author of the Animals in Focus Mystery series. Drop Dead on Recall, the first in the series, won the Dog Writers Association of America Award in Fiction, Mystery, or Humor. She is also the author of 17 nonfiction books, six of which have won major awards from the Dog Writers Association of America and the Cat Writers Association. For the past two decades Boneham has been showing her Australian Shepherds and Labrador Retrievers in various canine sports. She has also bred top-winning Aussies, and founded rescue groups for Aussies and Labs. Boneham holds a doctorate in folklore from Indiana University and resides in Wilmington, N.C. For more information, go to SheilaBoneham.com.